Luckyfinds: I love Yoshinoya, Japan's #1 Beef Bowl! I love Yoshinoya, Japan's #1 Beef Bowl! WHY DO YOU LOVE YOSHINOYA? I love Yoshinoya, Japan's #1 Beef Bowl because it takes few minutes to get my bowl of steaming rice and some fantastic Japanese toppings! For those people who are not into eating raw fish or meat but would love to try good tasting Japanese food, Yoshinoya is the best place to go if you are looking for a quick fix. They offer fully-cooked meals with really yummy rice toppings, which of course includes Japan’s famous beef bowls (known as Gyudon). It operates by its motto, “cheap, quick and yummy”! 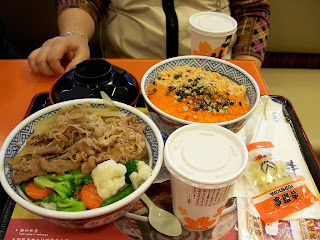 I had my first taste of Yoshinoya in 2005 while on vacation in Hongkong. A friend brought me to their store along Des Voeux Road West one time. It was almost 2PM, and I was surprised that the store was jampacked even after lunchtime. I later learned that Yoshinoya enthusiasts were availing store discounts from 2PM to 4PM. This is my official contest entry to win the 500 worth of Yoshinoya Gift Certificate. Get a chance to win it HERE as well.